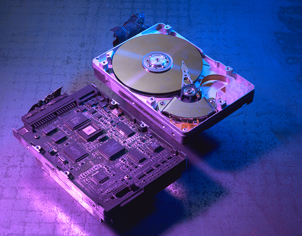 Most computers use a hard drive to store data (documents, pictures, etc.). These are inherently reliable, but can fail and such failure is unpredictable. For small companies loss of correspondence with clients and suppliers, invoices, etc. has a major impact and, unfortunately, has often led to severe financial difficulties and even company failure. For home users loss of years of treasured digital photos is obviously something no one would want to contemplate. We are always happy to advise on the most appropriate way for you to secure your data. The solution we provide will be cost effective, but will also be easy to use (the latter is one of the key reasons people do not back up their data). If the worst should happen and you do lose your data (either from a computer hard disk or a camera memory card), we are often able to recover the data in-house at reasonably low cost. In cases of more serious damage, our partnership with Ontrack Data Recovery means that we are able to offer more advanced recovery techniques, including clean room disassembly of the hard drive, but that is obviously significantly more expensive.